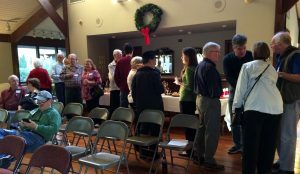 The Annual Membership Meeting is traditionally held toward the end of the calendar year, generally in conjunction with a Neighborhood Christmas Party. The program includes Board member elections, the association financial report, and a review of the year’s activities. This informal event is a great way to mingle with neighbors, catch up on news, and enjoy the season. In recent years, the association has sponsored “Fire Ant Funerals” in the fall or spring to keep the fire ant population at bay. The product used is not a pesticide but a fire ant sterilant that prevents queen ants from reproducing. It is easy to apply and is safe for children, animals, and beneficial insects. 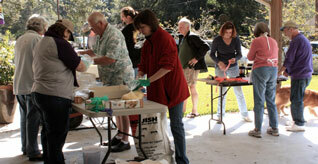 Volunteers distribute packets of sterilant and spreading instructions to Magnolia Woods residents who choose to participate. The more households that participate and the more coordinated the effort, the greater the benefit. Otherwise, ants can move into already treated yards from yards that have not been treated. This valuable neighborhood service requires a high degree of coordination and cooperation among neighbors. Please consider lending a hand. 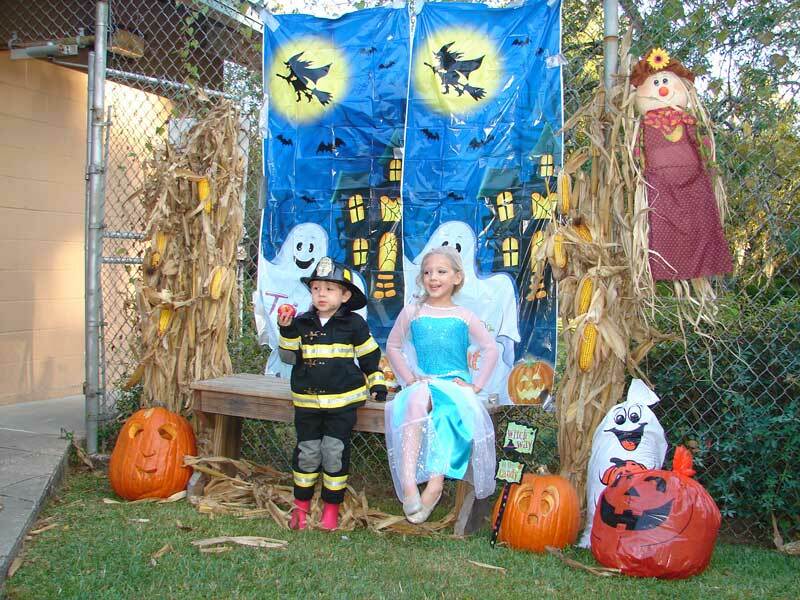 Each Halloween the association hosts a party for neighborhood families just before trick-or-treating begins. This annual celebration of autumn includes lots of traditional activities: costume contests for children of various age levels, a family costume competition, treats, Halloween crafts and games, and refreshments for all. This party gives neighbors of all ages a chance to get to know each other and have fun together. 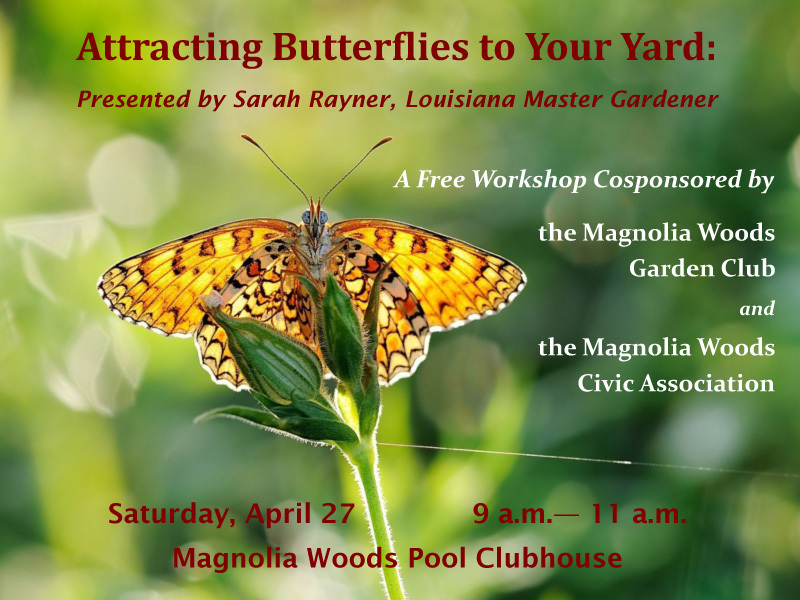 Each month, the Magnolia Woods Garden Club selects a winner and two runners-up for the Garden of the Month award. Recipients are chose by Garden Club members based on criteria established by the club. Selecting Native, Storm-Resistant Trees, a lecture and tour of the LSU Hilltop Arboretum held in conjunction with the reforestation program. Residents who have lived in Magnolia Woods for several decades remember a different environment than that which exists today. Our yards and streets were once much shadier and cooler than they are now. Many more large shade trees graced our yards from the beginning of the neighborhood because the people who chose to live here wanted to live in a forest not a cow pasture and took pains to preserve as many trees as possible. There was a “forest ethic”, an understood value of trees shared by those early residents. 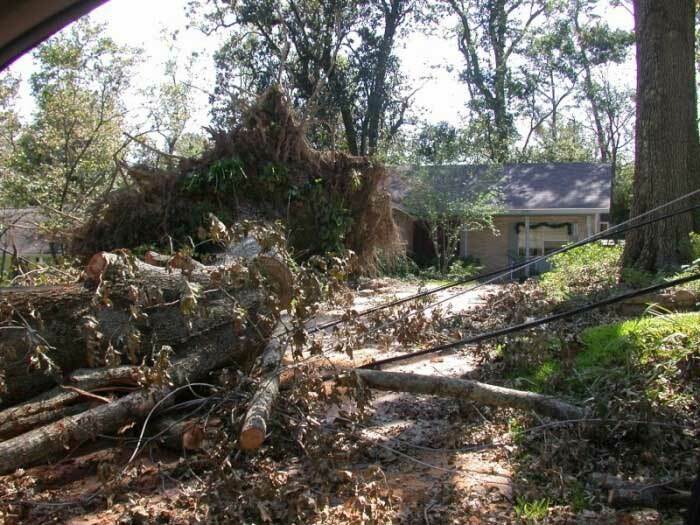 Over time a series of hurricanes, Betsy, Andrew, Katrina and Gustav took their toll on many of our magnificent trees. Old age and disease have taken their toll, as well. 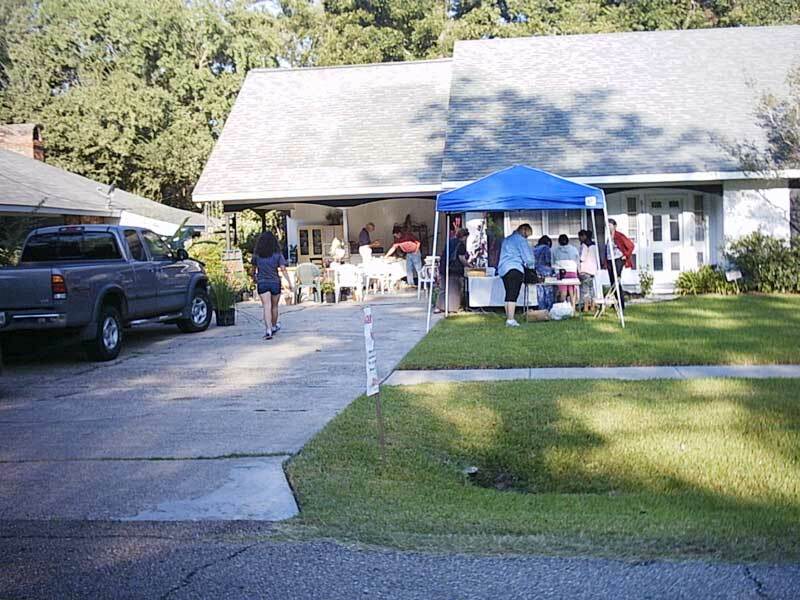 Many of the neighborhood’s original residents have passed away or moved, to be replaced by a new generation unaware of the forest ethic of Magnolia Woods. Still, many beautiful trees remain and continue to draw people to the park-like setting we enjoy, and often take for granted. Although they often outlive us, trees, like all living things are mortal and in order to maintain and even mazimize the benefits they provide we must continue to replant. MWCA began a reforestation program in fall 2012, working with the LSU AgCenter’s forestry specialists and the Hilltop Arboretum to select native Louisiana tree species that are storm and drought resistant. The association began by offering trees first to those whose yards were stripped bare by the storms and has continued thereafter on a first come first served basis. Residents who are able bodied are asked to plant the trees they select, but MWCA members and other volunteers assist those who need help. The first year, 25 trees were placed. By December 2014, more than 80 trees had been planted. In 2014, the MWCA switched the project from spring to fall to give the young trees a better chance to become established before having to withstand the heat of summer. The Magnolia Woods Reforestation Project will continue each fall with the goal of maintaining and restoring the natural beauty of our neighborhood. 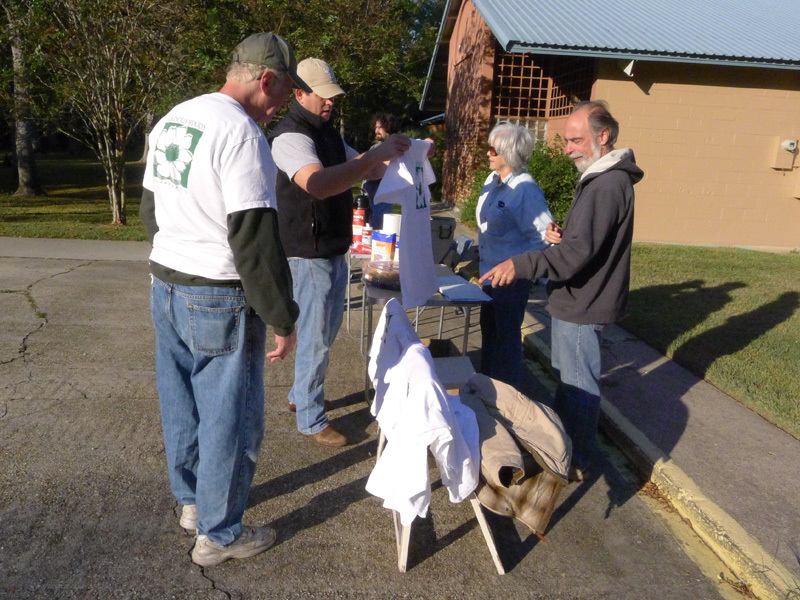 Twice annually, the civic association organizes a volunteer effort to scour the neighborhood and remove litter and debris from curb sides. When unsightly litter is removed and recycled, our neighborhood offers a cleaner and healthier environment. This, in turn, boosts neighborhood pride, protects homeowners’ investment in their property, and makes Magnolia Woods a more attractive destination for home buyers.